This is the first part in the Making the Most series. Start the new year right! Over winter break my load lightened -- no speeches or essays to grade, no student emails to answer, no lectures to plan. I used some of this extra time to focus on my house. It's not that I hadn't cleaned during the sixteen-week semester; I had. It's just that I also had let things accumulate -- like a large pile of the girls' summer clothes that I had weeded out of their closets as the temperature dropped throughout the fall -- without properly sorting and putting them away. I focused on one room at a time, and I discovered something: We have a lot of stuff. 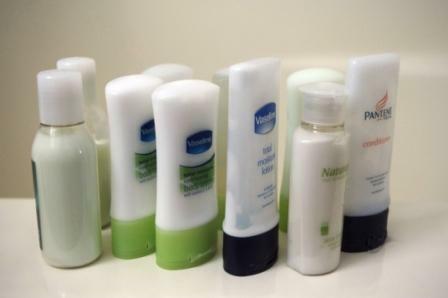 Take this collection of travel-sized shampoos, conditioners, and lotions, for example. They were picked up at hotels over the years and tucked into a corner of our bathroom cabinet, standing attentive like a small sentry waiting for orders. But I never used them, which made me question: Why do I need to have over a dozen of them? The answer is simple. I don't. So, over the past two weeks, I've been squeezing my daily shampoo and lotion out of miniature bottles. Odd as it might sound, it feels productive and resourceful. Still, it's easy to accumulate good stuff. It's easy to keep candles without burning them, or hold onto stationery without sending it, or own jewelry without wearing it. But this year? 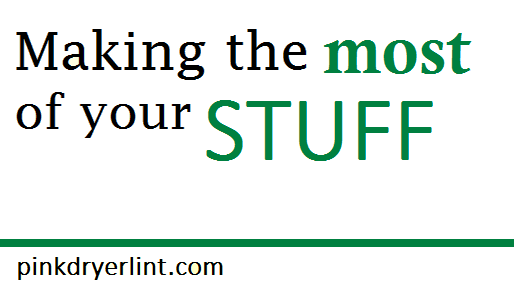 This year I plan to make the most of my stuff by doing the simplest thing: using what I have. I'm not suggesting extravagant over-consumption, but rather to enjoy and use what's right at my disposal -- whether our craft supplies, our nice dishes, my favorite perfume, yesterday's leftovers, or a small army of travel-sized toiletries. 1) Take an honest inventory. Do you need it? Do you like it? Can you use it? Or, is this item just taking up space? 2) Use it up. My mini-shampoos are finally fulfilling their purpose. I mean, if I were a travel-sized shampoo, I would be much happier sudsing someone's hair than languishing next to a bottle of Advil in a cabinet. They're living the dream! 3) Toss, sell, or donate. You know that peaceful sensation when all of the toys are cleaned up and you see an expanse of freshly-vacuumed carpet (until your kids re-enter the room)? In those moments it's clear that less is more -- that the absence of clutter is calming and pleasurable. Take the plunge. Don't cling to stuff you're not using. Part ways with those clothes you no longer wear, the books you've already read, the toys your children have outgrown, or that piece of furniture that's no longer functional for your space. Sell or donate these items to someone who will benefit from them, or toss them if they're unusable. One trip to Goodwill with a trunk full of donations can open a lot of space in your home (a benefit for you) and allow these neglected items to find use in a new home where they'll be appreciated (a benefit to others.) Win-win. You sound just like me! Since having my son 3 years ago I feel like my 'stuff' is building up and engulfing me! I have been slowly working my way through some stuff and doing just as you say - donating, selling, binning or re-purposing! Looking forward to the follow-on post(s).